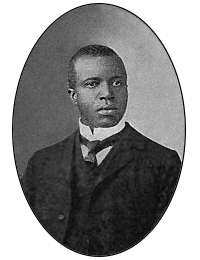 Scott Joplin is kent as the "Keeng o Ragtime"
Ragtime – an aa spelled rag-time or rag time – is a muisical style that enjoyed its peak popularity atween 1895 an 1918. ↑ Perlman, Itzhak. "THE EASY WINNERS and other rag-time music of Scott Joplin". Retrieved 2010-04-26. ↑ Berlin, Edward. "Ragtime". The Grove Music Dictionary. Oxford University Press. Retrieved 2009-06-29. This page wis last eeditit on 22 October 2017, at 23:30.